The Galaxy Tab 3 10.1 comes with a full-fledged document editor on board, which allows you to edit Word files, pdf's, spreadsheets and PowerPoint presentations, as well as connect to various cloud services such as Box, Dropbox, and Google Drive. S Planner replaces the old Calendar app that usually comes with Samsung smart devices, and is just as useful even without the S-pen. The tabbed interface lets you easily toggle between year, month, week, day list and task views. The Memo app allows you to create notes which can then be quickly shared via sms or email, or even automatically synced to your Google Drive account. Oddly, instead of the usual clock app, the Tab 3 10.1 features a few applications which perform some - but not all - of the same functions. Alarm lets you create alarms which can be set to go off not only at various times, but during certain days of the week as well. The World Clock pops up the various cities on a globe, letting you select them for a quick overview the local time zone. The Calculator features big buttons, and offers advanced math functions as well. The preloaded Paper Artist app imports a photo and runs a filter over it (there are plenty to choose from). Then you can go in and color certain areas for added effect. The Samsung P5200 Galaxy Tab 3 10.1 comes with a GPS receiver, which got a satellite lock in couple of minutes with A-GPS turned off. A-GPS can speed this up quite a bit, but requires Internet access. We have to say, we didn't experience any issues with the GPS performance. The Galaxy Tab 3 10.1 comes with Google Maps and Navigation. Voice-guided navigation has become a viable solution since the v5.0 update. Vector maps are smaller and easier on the data traffic and reroute is an option if you go off course without the need to connect to the Internet. In fact, the only time you need a data connection is when you initially plan the course - Navigation will cache the needed maps. The Google Play Store is laid across several scrollable tabs - categories, featured, top paid, top free, top grossing, top new paid, top new free and trending. Accessing the Play Store with our Galaxy Tab 3 10.1 revealed a couple of sections with apps specifically tailored for use with large screen devices, which we found very helpful. Apps usually have several screenshots (some even offer a demo video) so you can get an idea of what the app looks like before installing it. You can also check out comments and ratings, as well as the number of downloads and so on, to help you decide whether the app is worth it. The Google Play Store is full of all sorts of apps. From music / video players, to file managers and various tools, you'll always see something worth a try. 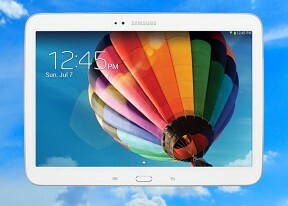 Keep in mind, though, that there will be some apps that are incompatible with the Galaxy Tab 3 10.1 due to its x86 CPU. Samsung has added its own app store to the mix. It features largely the same type of interface as Google Play, except here you'll find a far smaller number of apps. The good news is Samsung uses this repository to distribute some exclusive titles and some promotional offers, available only to its customers.